50% juice/50% water. With natural flavourings. Sweetened only with real fruit. 100% naturally sourced ingredients. A blend of delicious fruit and refreshment. No added sugars or sweeteners. No artificial colours or flavourings. 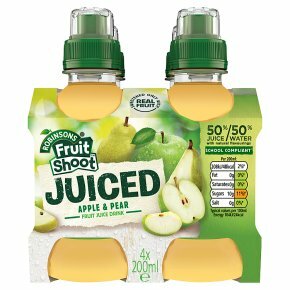 Preservative free.School compliant** **Fruit Shoot Juiced meets the standards for drinks in schools in England, Scotland and Wales at the date of manufacture.